(Newser) – He wanted a better salary. That's the alleged motive of Empire actor Jussie Smollett for staging a fake assault on himself, according to Chicago police. Chief Eddie Johnson told reporters Thursday that the 36-year-old actor wasn't happy with what he was making on the Fox show and thought he could improve his position as the victim of a hate crime, reports CBS News. The first step taken by Smollett, who is black and gay, was to send himself a threatening, anonymous letter, says Johnson. 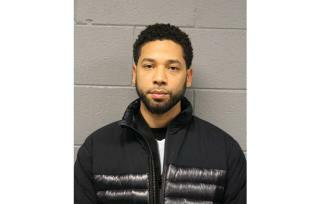 When that failed to do much, Smollett concocted the idea of having two men attack him in downtown Chicago, say police. He allegedly enlisted two acquaintances, a pair of Nigerian brothers, who've cooperated with police. I don't really buy it , the Lynching Law was being debated and I believe some politicians and celebrities wanted to manufacture an incident to give the bill some much needed impetus . What a f-ing idiot. I hope they throw the book at him and he loses his job he was so unhappy with.